Figure 1.1 shows a completed Excel worksheet that will be constructed in this chapter. The information shown in this worksheet is top-line sales data for a hypothetical merchandise retail company. 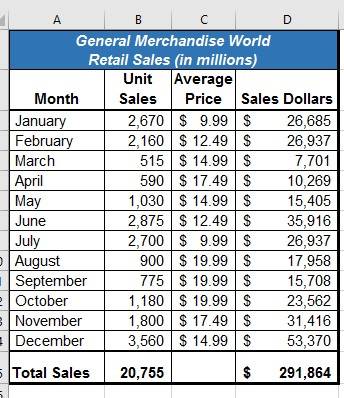 The worksheet data can help this retailer determine the number of salespeople needed for each month, how much inventory is needed to satisfy sales, and what types of products should be purchased. Locate Excel on your computer. Click Microsoft Excel to launch the Excel application and present you with workbook options. Click the first option; “Blank Workbook”. Once Excel is started, a blank workbook will open on your screen. A workbook is an Excel file that contains one or more worksheets (sometimes referred to as spreadsheets). Excel will assign a file name to the workbook, such as Book1, Book2, Book3, and so on, depending on how many new workbooks are opened. 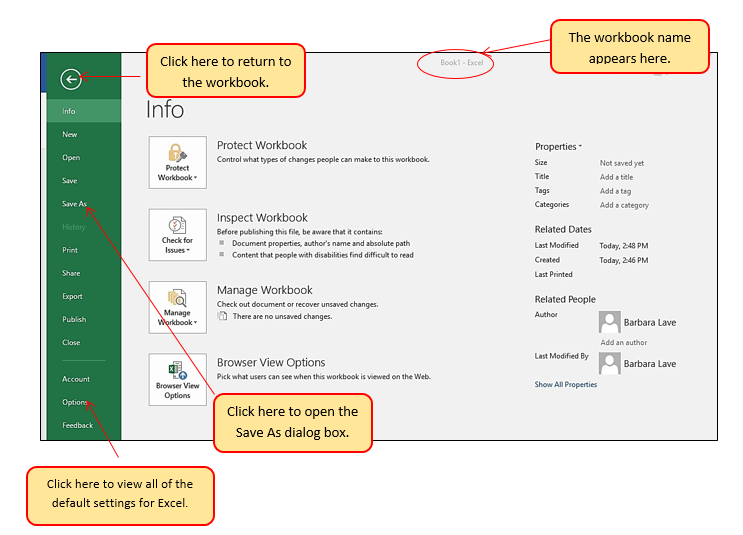 Figure 1.2 shows a blank workbook after starting Excel. Take some time to familiarize yourself with this screen. Your screen may be slightly different based on the version you’re using. 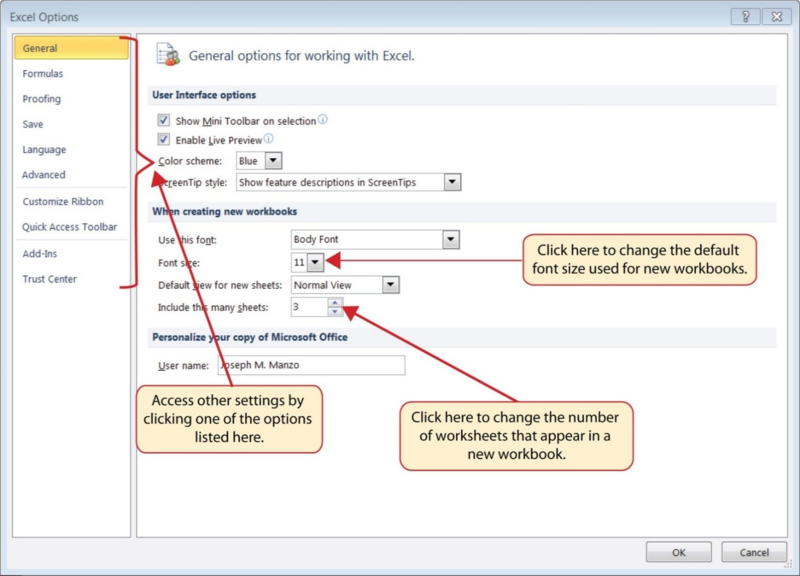 Your workbook should already be maximized (or shown at full size) once Excel is started, as shown in Figure 1.2. However, if your screen looks like Figure 1.3 after starting Excel, you should click the Maximize button, as shown in the figure. Check to make sure column letter D and row number 5 are highlighted, as shown in Figure 1.4. 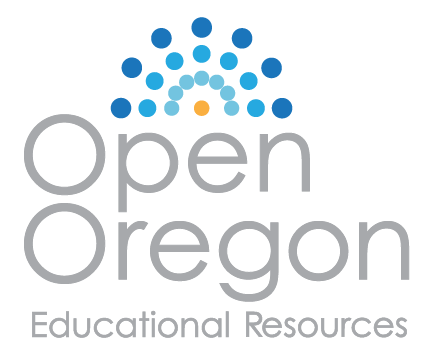 Note: Your highlighted column letter and row number may be different than figure shown. Release the left mouse button. You should see several cells highlighted, as shown in Figure 1.5. This is referred to as a cell range and is documented as follows: A1:D5. Any two cell locations separated by a colon are known as a cell range. The first cell is the top left corner of the range, and the second cell is the lower right corner of the range. At the bottom of the screen, you’ll see worksheets. Depending on your version of Excel, you will see either three as displayed above or just one. If you only have one sheet, click the “Insert Worksheet” to add a worksheet. Depending on your version, you instead may have a + sign; a click on the + adds an additional worksheet as well. This is how you open or add a worksheet within a workbook. Add another worksheet so that you now have three sheets displaying here. 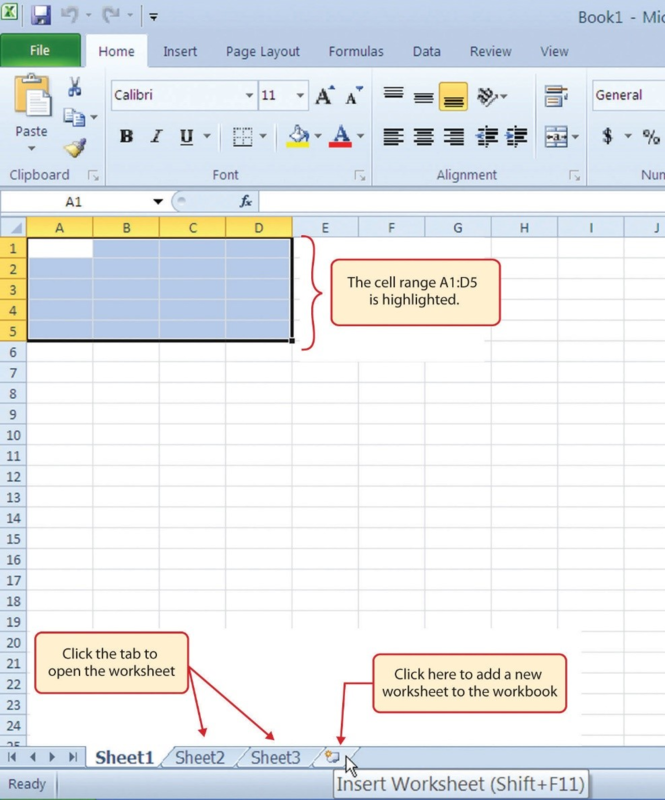 Click the Sheet1 worksheet tab at the bottom of the worksheet to return to the worksheet shown in Figure 1.5. 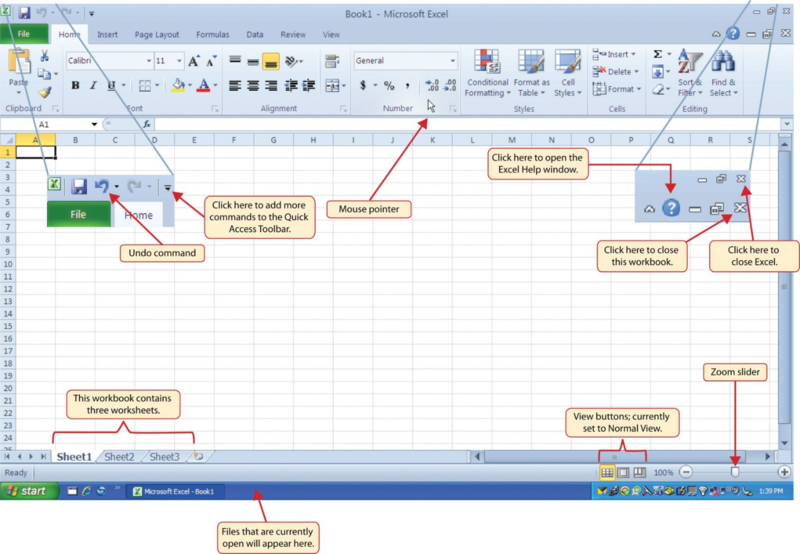 Excel’s features and commands are found in the Ribbon, which is the upper area of the Excel screen that contains several tabs running across the top. Each tab provides access to a different set of Excel commands. Figure 1.6 shows the commands available in the Home tab of the Ribbon. Table 1.1 “Command Overview for Each Tab of the Ribbon” provides an overview of the commands that are found in each tab of the Ribbon. The Ribbon shown in Figure 1.6 is full, or maximized. The benefit of having a full Ribbon is that the commands are always visible while you are developing a worksheet. However, depending on the screen dimensions of your computer, you may find that the Ribbon takes up too much vertical space on your worksheet. If this is the case, you can minimize the Ribbon by clicking the button shown in Figure 1.6. When minimized, the Ribbon will show only the tabs and not the command buttons. When you click on a tab, the command buttons will appear until you select a command or click anywhere on your worksheet. 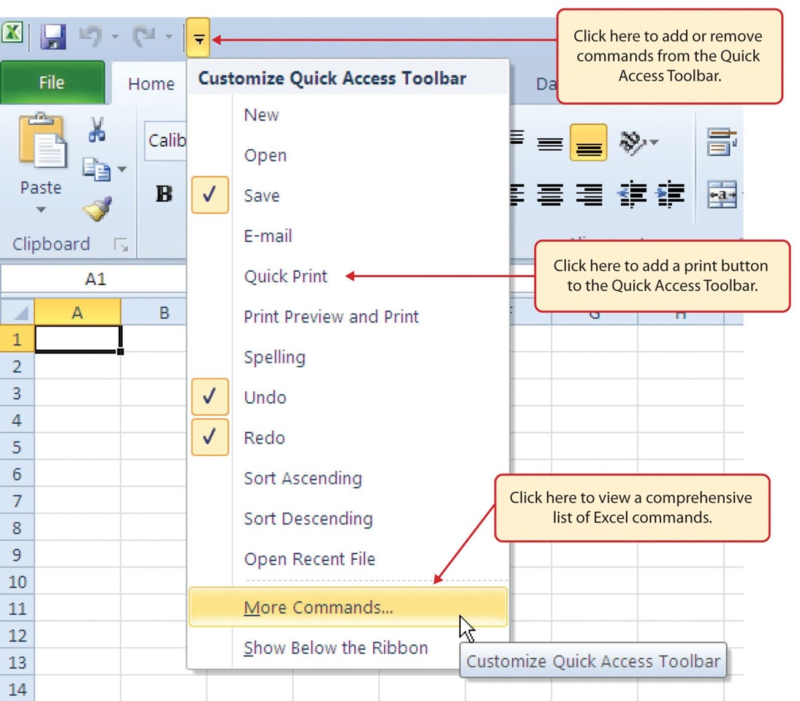 The Quick Access Toolbar is found at the upper left side of the Excel screen above the Ribbon, as shown in Figure 1.7. This area provides access to the most frequently used commands, such as Save and Undo. You also can customize the Quick Access Toolbar by adding commands that you use on a regular basis. By placing these commands in the Quick Access Toolbar, you do not have to navigate through the Ribbon to find them. To customize the Quick Access Toolbar, click the down arrow as shown in Figure 1.7. This will open a menu of commands that you can add to the Quick Access Toolbar. If you do not see the command you are looking for on the list, select the More Commands option. In addition to the Ribbon and Quick Access Toolbar, you can also access commands by right clicking anywhere on the worksheet. Figure 1.8 shows an example of the commands available in the right-click menu. The File tab is also known as the Backstage view of the workbook. It contains a variety of features and commands related to the workbook that is currently open, new workbooks, or workbooks stored in other locations on your computer or network. Figure 1.9 shows the options available in the File tab or Backstage view. To leave the Backstage view and return to the worksheet, click the arrow in the upper left-hand corner as shown below. Included in the File tab are the default settings for the Excel application that can be accessed and modified by clicking the Options button. 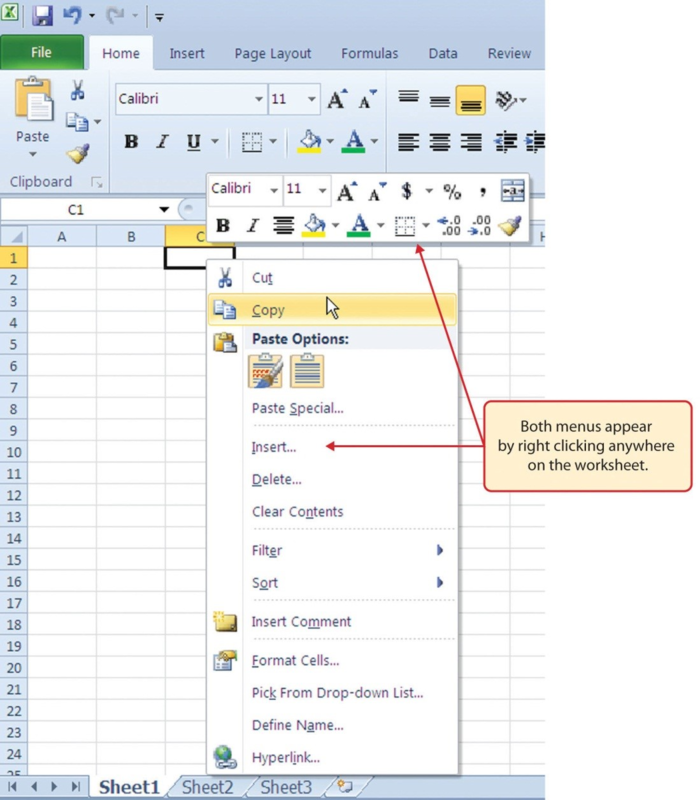 Figure 1.10 shows the Excel Options window, which gives you access to settings such as the default font style, font size, and the number of worksheets that appear in new workbooks. 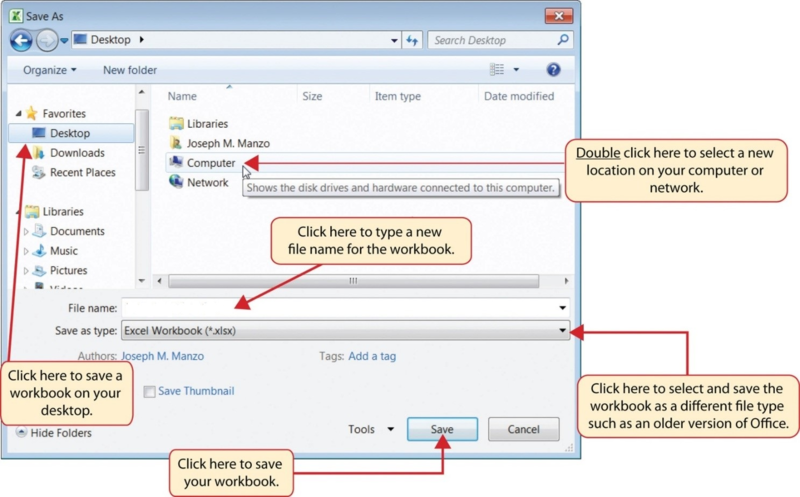 Once you create a new workbook, you will need to change the file name and choose a location on your computer or network to save that file. It is important to remember where you save this workbook on your computer or network as you will be using this file in the Section 1.2 “Entering, Editing, and Managing Data” to construct the workbook shown in Figure 1.1. The process of saving can be different with different versions of Excel. Please be sure you follow the steps for the version of Excel you are using. 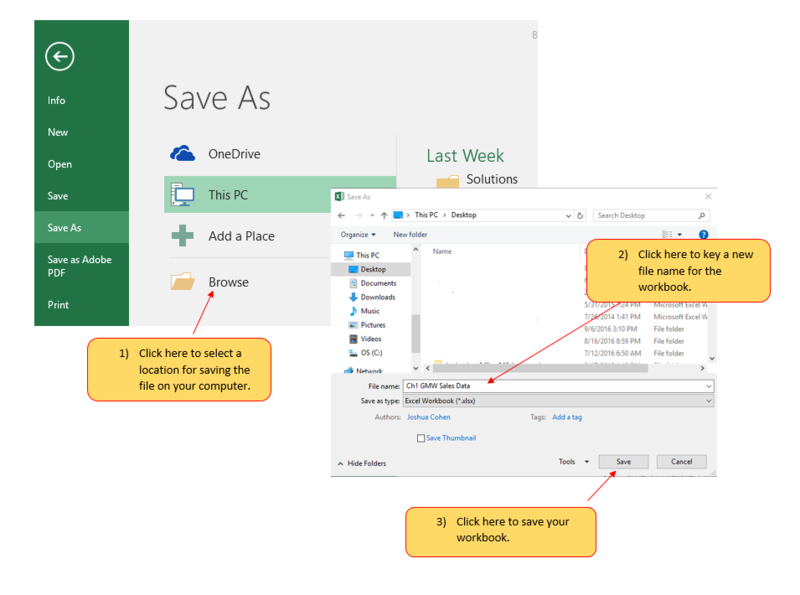 The following steps explain how to save a new workbook and assign it a file name. If you have not done so already, open a blank workbook in Excel. When saving your workbook for the first time, click the File tab. Click the Save As button in the upper left side of the Backstage view window. This will open the Save As dialog box, as shown in Figure 1.11. Click in the File Name box at the bottom of the Save As dialog box and use the BACKSPACE key to remove the current default name of the workbook. Type the file name: CH1 GMW Sales Data. Click the Desktop button on the left side of the Save As dialog box if you wish to save this file on your desktop. If you want to save this workbook in a different location, such as a USB drive, select your preferred location. As you continue to work on your workbook, you will want to Save frequently by click either the Save button on the Home ribbon; or by selecting the Save option from the File menu. Click the File tab and then the Save As button in the left side of the Backstage view window. This will open the Save As dialog box. Determine a location for saving on your computer by clicking Browse on the left side to open the Save As dialog box. Review the settings in the screen for correctness and click the Save button. Select a location on your PC. 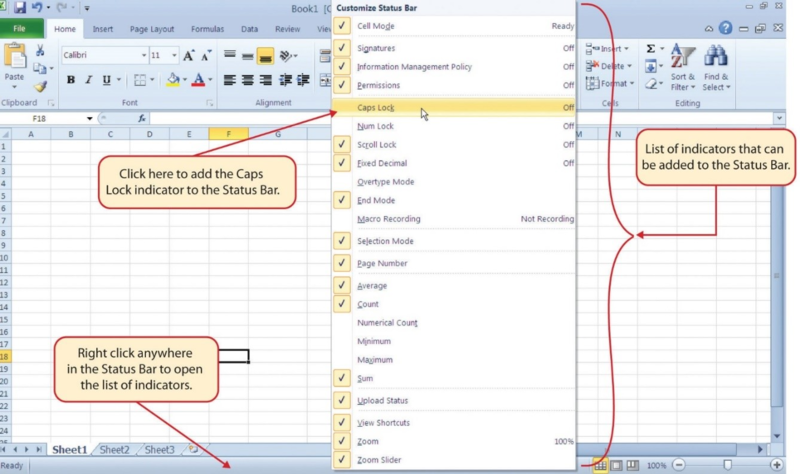 Place the mouse pointer over any area of the Status Bar and right click to display the “Customize Status Bar” list of options (see Figure 1.13). Select the Caps Lock option from the menu (see Figure 1.13). Press the CAPS LOCK on your keyboard again. The indicator on the Status Bar goes away. The Help feature provides extensive information about the Excel application. Although some of this information may be stored on your computer, the Help window will automatically connect to the Internet, if you have a live connection, to provide you with resources that can answer most of your questions. 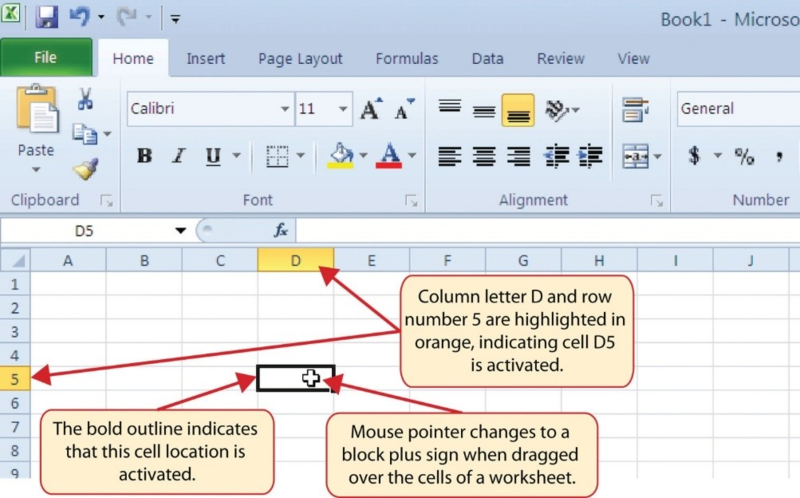 You can open the Excel Help window by clicking the question mark in the upper right area of the screen or ribbon. With newer versions of Excel, use the query box to enter your question and select from helpful option links or select the question mark from the dropdown list to launch Excel Help windows.